Single-seat single-engined high-wing monoplane with conventional three-axis control. Wing has unswept leading edge, swept forward trailing edge and tapering chord cruciform tail. Pitch control by elevator on tail; yaw control by fully flying rudder with additional fin; roll control by half-span ailerons; control inputs through stick for pitch/roll and pedals for yaw. Wing braced from above by kingpost and cables, from below by cables; wing profile 80% double-surface. Undercarriage has three wheels in tricycle formation with additional tailwheel; no suspension on nosewheel and steel-spring suspension on main wheels. Push-right go-right nosewheel steering connected to yaw control. No brakes. Aluminium-tube framework, with optional pod. Engine mounted below wing driving pusher propeller. Aluminium tubing to British HT3OTF specification. Polyester sailcloth. 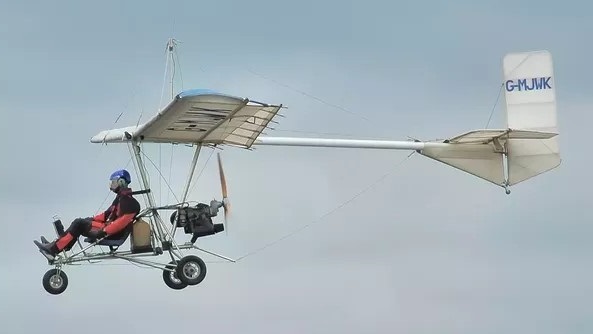 At the end of 1981, the Pathfinder appeared, and as the first 'fully conventional' British-designed three-axis microlight in quantity production, it found a ready market. By the time production ended in early 1983, some 70 aircraft had been built and the Pathfinder had gained a reputation for durability and good performance, qualities which were underlined by its performance in the 1982 London-Paris, in which nine started and nine finished, seven of them in the first ten. In addition, a Pathfinder piloted by Gerry Breen was joint winner of the speed award. The Pathfinder was normally sold with a 330 cc Robin EC34PM engine, but a number were built with a 440 cc Robin EC44. The 440 version was not intended as a high-performance option (though it was indeed faster) but was designed to provide good take-off and climb characteristics for pilots whose weight was close to the Pathfinder's 220 lb (100 kg) payload. Both versions of the Pathfinder were replaced by the Pathfinder II in early 1983, and as a result the earlier aircraft is now called Pathfinder I. Engine: Robin EC34PM, 28hp, at 6500rpm. Propeller diameter and pitch 54x30inch, 1.37x0.76m. Max static thrust 200 lb, 91 kg. Power per unit area 0.19 hp/sq.ft, 2.0 hp/sq.m. Length overall 23.0 ft, 7.01 m.
Chord at tip 4.3ft, 1.31m. Total wing area 148 sq.ft, 13.7 sq.m. Wheel track 4.5 ft, 1.37 m.
Nose-wheel diameter overall 13 inch, 33cm. Empty weight 293 lb, 133 kg. Max take-off weight 513 lb, 233 kg. Payload 220 lb, 100 kg. Max wing loading 3.47 lb/sq.ft, 17.0 kg/q.m. Max power loading 18.3 lb/hp, 8.3 kg/hp. Load factors: +5.5, -4.0 ultimate. Never exceed speed 70mph, 113kph. Economic cruising speed 50 mph, 80 kph. Stalling speed 25 mph, 40 kph. Range at average cruising speed 125 mile, 201 km. Engine: Robin EC44, 40hp, at 6500rpm. Propeller diameter and pitch 54x36inch, 1.37x0.91m. Max static thrust 275 lb, 125 kg. Power per unit area 0.27 hp/sq.ft, 2.9 hp/sq.m. Fuel capac-ity 5.4 US gal, 4.5 Imp gal, 20.4 litre. Empty weight 305 lb, 138 kg. Max take-off weight 525 lb, 238 kg. Max wing loading 3.55 lb/sq.ft, 17.4 kg/sq.m. Max power loading 13.1 lb/hp, 6.0 kg/hp. Max level speed 70 mph, 113 kph. Max cruising speed 70 mph, 113 kph. Max climb rate at sea level 800 fpm, 2.0m/s. Take-off distance 150 ft, 45 m.
Range at average cruising speed 60 mile, 97 km.